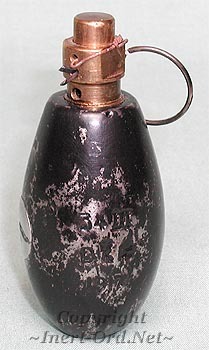 The No.34 Hand Grenade was developed to counter the introduction of the German Model 1917 Eierhandgranate. 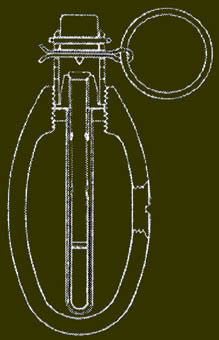 The British explored a number of ideas for this small fragmentation grenade with maximum throwing range, developing a total of five Marks of this type. This one is stamped "34 III" on the body. 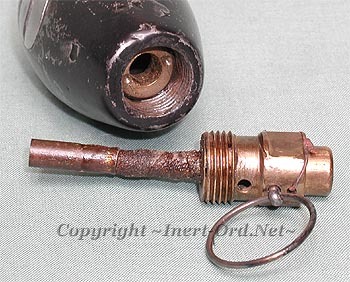 The No.34 Mk.III has a percussion actuated delay fuze. The pin is removed and the plunger is slapped against a suitably hard object. The plunger cuts a shear wire and fires a primer cap, which ignites the delay which burns down to a detonator. There is a vent hole in the fuze body for escaping gases. The idea of a very small, compact grenade continues to modern times. Shown here are some of the world's smallest hand grenades for comparison.